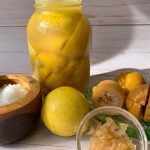 Preserved or fermented lemons are a delicious way to add flavor and health benefits to many of your favorite dishes. Most Americans use only the flesh of the lemon, but fermenting transforms the rind into a sparkling addition to grains, salad dressings, pasta, poultry and seafood dishes. Wash lemons in warm water and remove any butts of stem on the ends. Quarter lemons, being careful not to cut through the bottom. They should remain attached at the bottom but open with 4 sections. Combine lemon juice and kombucha in a measuring cup. Sprinkle interior of each lemon with sea salt. One at a time, place lemons in Mason jar, and, using the back of a wooden spoon, mash each lemon to release the juice. Continue to add and mash lemons until the jar is full. Store at room temperature out of direct sunlight for 10 days. Flip the jar over each day, so you are rotating the lid on the top and then the lid on the bottom every other day. This keeps the lemons submerged. After 10 days store in the refrigerator. Lemons keep for a year refrigerated. 10. To use, finely chop the rind, discarding the flesh.